Every effort is made to effect shipment of your order timeously however unforeseen circumstances may cause delays. Should we be faced with such an occurrence Southern Business School (Pty) Ltd will contact you via email and provide a revised shipping schedule. Where a fee is required by Southern Business School, as indicated on registration for a qualification or subject, the full fee shown must be paid and represents ONLY a portion of the full qualification and serves as the deposit/registration fee and any amount over and above the stipulated registration fee will count towards subject registration(s) or study material(s). This will mean that additional payments can be made once your subjects are finalised and you are charged for them accordingly as shown on your account statement. Order processing will not begin until we receive a confirmed order and full payment and supporting documentation. Should you for any reason wish to cancel your purchase you will be liable for a 15% handling fee. You must advise us in writing of your cancellation and any such cancellation must be signed by the person who made the original purchase. The goods must be returned to us undamaged in the original packaging within 14 calendar days. Registration fees cannot be refunded, i.e Non-refundable. * Note: Southern Business School (Pty) Ltd recommends that you use Speed Services Couriers (South African Postal Services) for all returns as it offers shipment tracking through a 24 hours customer helpline. Should you choose to use a carrier that does not offer a tracking facility and the goods are lost then no refund or return will be considered. All transactions will be processed in South African Rands (ZAR) and Namibian Dollar (N$). Southern Business School (Pty) Ltd endeavours to offer you competitive prices on current products and services; you're total order price will include the price of the purchase plus any applicable sales tax and shipping charges (on the day of shipping). Southern Business School (Pty) Ltd reserves the right to change pricing of products and services at any time without prior notice. Should Southern Business School (Pty) Ltd reduce it’s price on any shipped products within 10 working days of shipment, you may contact us and request a refund of the difference between the price you were charged and the reduced selling price. To receive the refund you must contact us within 14 days of shipment. We accept MasterCard and Visa credit cards for payment through our website only. If you do not have a credit card please utilise one of the other payment options, or simply log off and return to the site at a later time to complete your order. All of your order details will be saved online under in the Your Account section available for use whenever you’re ready! Sorry for the inconvenience. One of the most widely used ways of sending money online. Once you have added the required items to your shopping cart, proceed to “Checkout” and follow the order processing instructions. Select the option to pay via EFT. 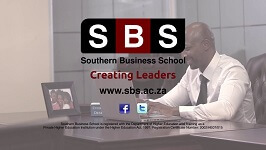 You will then have to load Southern Business School (Pty) Ltd as a beneficiary on your internet banking and use the unique order number in the reference line for your payment. This should ensure speedy processing and delivery of your selected products. You may pay for your products through a direct deposit. It’s exactly the same as doing an EFT payment, except you’ll have to go into your bank and physically make your direct deposit there. Please fax through your deposit slip to us on (011) 662 1462 to ensure your payment is confirmed and registration detail is updated as quickly as possible. For more information about how to pay, special payment requirements and other payment options, please contact our Support Team on email finance@sbs.ac.za. I understand that all the designs and trademarks are registered to Southern Business School (Pty) Ltd and hereby accept the terms and conditions. I undertake not to copy/duplicate the trademarks and designs directly or indirectly in anyway and understand the legal implications thereof. Should I be found to be in violation of this agreement I understand that I will be held liable for all legal costs incurred by Southern Business School (Pty) Ltd for any civil action or any legal action deemed necessary against me. A copy of the ECT Act is available at //www.polity.org.za/pol/acts/2002.